Having lived at the Mosel for a number of years, we now have kind of a routine for tastings. We like to take friends with us, and we like to do several tastings in one day, usually a Saturday. This time around, we took our friends Ganna and Thorsten as well as Hannah, from whom I stole some of the photos for this blog post. For 16 June, we had arranged our first tasting at Weiser-Künstler, a young winery in Traben-Trarbach at the middle Mosel. 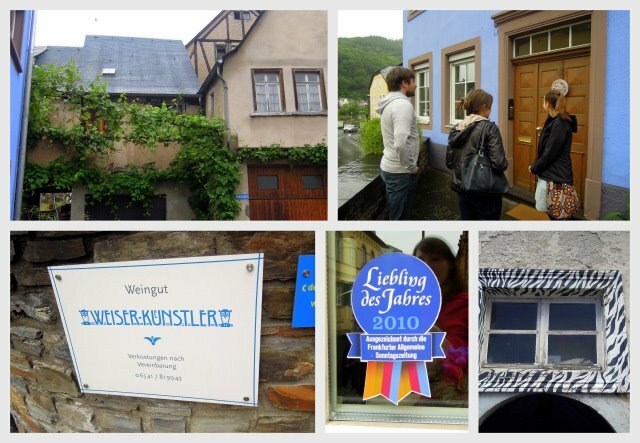 Traben-Trarbach is not just a village but a city, and also known for its art nouveau (Jugendstil) architecture. In a nice tribute to that, the winery’s labels are modelled in art nouveau style as well. We first came across them in summer of 2011, when my winefriend Yutaka recommended one of their wines on Facebook right when I was planning yet another wine trip. On our visit then, we were deeply impressed by their wines. They showed a very high level of skill and sophistication. In even more surprising news, they had the very first dry riesling that I actually enjoyed (almost loved! ): the 2010 Trabener Gaispfad Riesling Kabinett trocken. I was so stunned that we stocked up on those. In more familiar areas, I loved loved loved their 2008 Enkircher Ellergrub Spätlese. So, naturally, we wanted to visit them again this year. I emailed with Alexandra, the wife who is mostly in charge of the business side of things, and we were going back and forth a bit about the date. Then, I did not hear anything for a while. When I finally decided to call them before we left for Germany, Konstantin, the husband and winemaker, told me that he had just answered my email and that we were on for Saturday, 16 June at 11.30am! The Weiser-Künstler estate is pretty small, comprising just 2.8 hectares (about 7 acres) in the steep, epic Enkircher Ellergrub and Steffensberg as well as the Trabener Gaispfad vineyards (please check out the links: they are photos of the hills). The vineyards they leased in long term leases were likely to be given up when Konstantin and Alexandra took them over in 2005. They have garnered early praise from high places, among them (my beloved fellow riesling maniac) Jancis Robinson. The hills offer mostly ungrafted vines, some of them up to 100 years old, which lead to lower but more concentrated yields. While the Ellergrub is mostly blue slate, the Gaispfad offers red slate for the vines to grow on. These different slates lead to very different wines: I found a consistent streak of peach notes in virtually every Ellergrub wine we tried, while I did not notice that in the Gaispfad. The Steffensberg is in a side valley of the Mosel with more earthy soil of clay and yellow slate. Konstantin and Alexandra believe in naturally grown wines and use natural yeasts for fermentation. Their philosophy is to respect the grapes and create light, low-alcohol rieslings, mostly sweet. There is an interesting piece about them from 2010 on the Moselwineblog here. We embarked on our tour on a typical German summer day: cold and rainy. When we arrived at the deep blue colored estate, we found the door locked. I rang the bell, and a puzzled Konstantin answered through the buzzer: “Yeeeees?” When I told him my name and that we had an appointment, he said: “Please wait, I will come to the door.” When he opened, it became clear that he had totally forgotten about our tasting…but he had time, and so he took us in for a good 90 minutes of tasting. Konstantin is a modest and restrained person, with great wit and quite personable when you get to know him. One of our fellow tasters commented on his poet-like appearance and demeanor. And in a way that is true. His winemaking skills are so finessed and at the same time light-aired that they have something poetic about them. He led us through an awesome tasting. 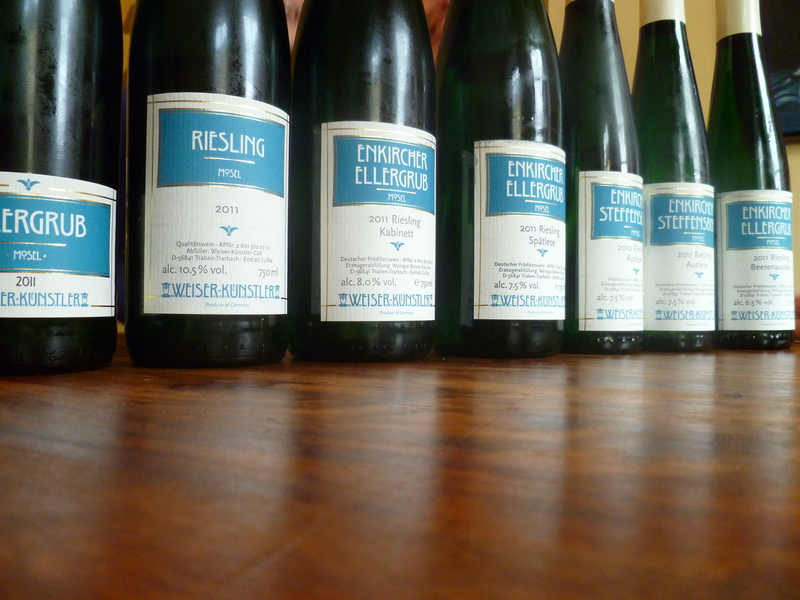 2011 has been a good year for them, just like across the Mosel. The yields were not only above the abysmally low 2010 yields, but also on par with the 2009: they harvested 45 hectoliters in 2011. 2012 so far has been a normal year for them, with the blossoming beginning in early June. We tried a total of 10 wines that day, ranging from the simple Gutsriesling to a Beerenauslese (BA). Again, I will be writing about some of the wines in seperate posts. Also, if you are unsure about the German wine classification, check out my at a glance sheet. We began with two of their dry rieslings. 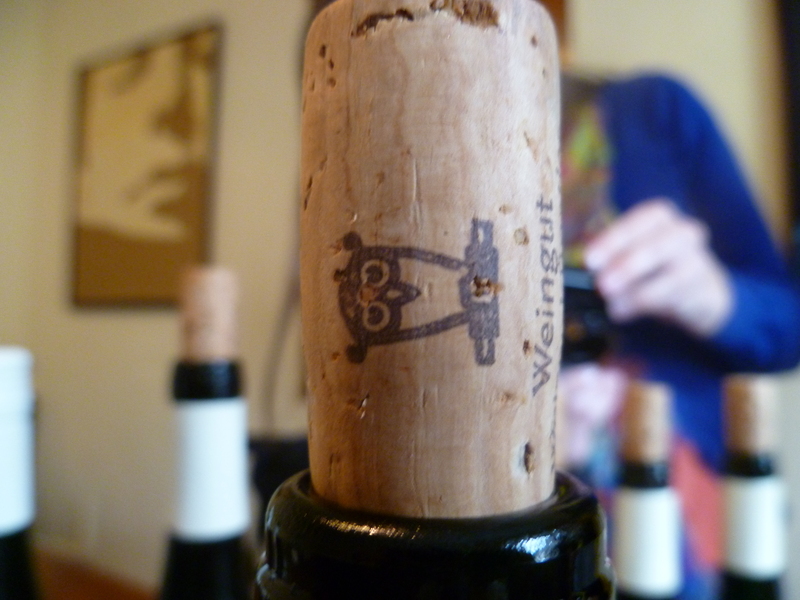 The 2011 Gaispfad Kabinett was again a star. The 2011 ELLERGRUB Spätlese showed an awesome peachy fruit nose with good acidity on the tongue. Another dry was not ready yet. It is still waiting for its release in September 2012: the GAISPFAD Große Eule (Big Owl). We moved on to the off-dry wines. 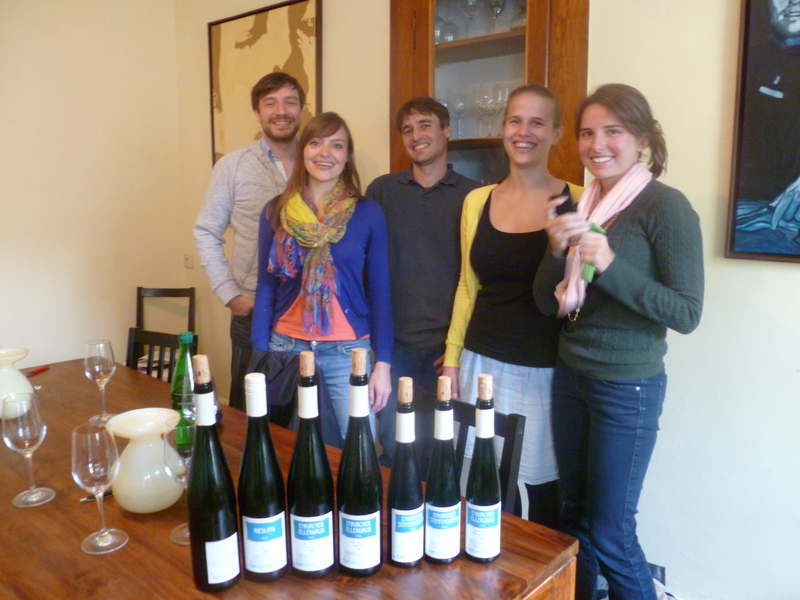 Their 2011 Riesling “Weiser-Künstler” was pure summer freshness. Great fruit, the acidity well connected to the sweetness. I could see myself drinking this one every evening over the summer. The STEFFENSBERG Spätlese had a fantastic nose of peach and apricot. I found some slight bitter notes on the palate that I was not overly fond of. In the category of residually sweet wines, we tried the Enkircher Ellergrub Kabinett and then Spätlese, and it was great to taste them right beside each other to bring out the differences in these two styles. More on that in this seperate post. We then moved on to their Auslesen. The grapes in the 2011 Enkircher Steffensberg Auslese had 100% noble rot (botrytis). It was very well balanced and highly concentrated with a honey-fruity sweetness to it. 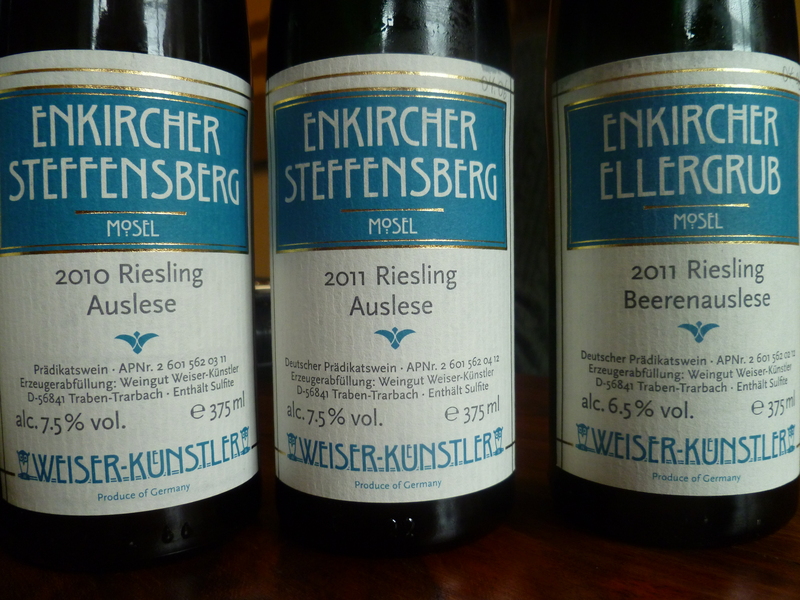 We then tried the 2010 Enkircher Steffensberg Auslese against it, and were completely taken aback by it. My note reads “Wahnsinnsding” (Wicked/Awesome thing). It has this 2010 acidity punch that 2011 does not offer, there was vanilla and strawberry. It was great, and since it was our wedding year, we stocked up on those, too. The 2011 Enkircher Ellergrub Auslese has a wonderfully light elegance to it. It is mineralic, and mild, with peaches all over the place and low in acidity. 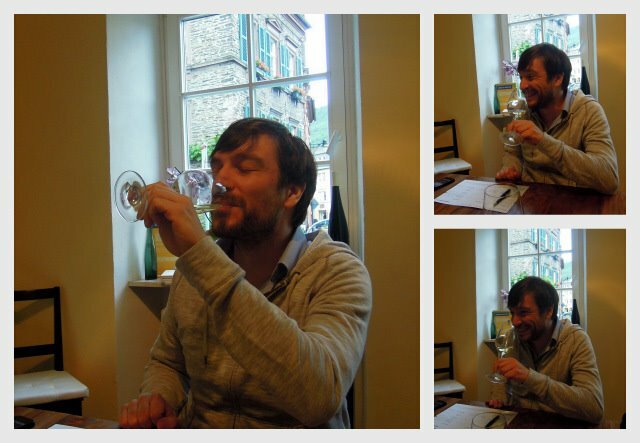 As a treat, Konstantin let us try his 2011 Enkircher Ellergrub Beerenauslese (BA), of which he only produced 50 litres, if my notes are correct. That makes somewhere around 150 half bottles. Words failed me on this one. I started taking notes. The nose was very herbal, the color amber. And then I just stopped and enjoyed the beauty of this wine. A wine of this level should not be drunk that young. It should be opened in 10 years, or 15, or 50. This will be good for decades. In this stadium, the sweetness is almost overbearing, and it is hard to not be overwhelmed. But this will be incredible in many years to come. Don’t get me wrong: it is incredible, but it will be even more. On that note, I want to end this tasting report. We had a blast. What a start to a day of wine tasting. Konstantin and Alexandra both speak great English, so don’t be shy if you ever get to the region. Their wines are available in the U.S., see here. For German and European readers, they also offer shipping, so just send them an email. It is well worth it. I would like to buy your wine and I live in Buffalo New York and would like it to be shipped to me or where to buy it .